The marine toad also known as the cane toad or the giant toad is a species native to the South and mainland central America. It has the title of being the world’s largest toad, being up to 15 cm but the largest recorded at 24 cm. The crane toad’s characteristics include a stout body with rough skin, they have shorter legs which they use to walk or even jump at a small pace. The toads back limbs are webbed while the front is not. The color varies between the male and the female with the male typically being a more yellow-cream color and the female ranging from a dark brown to a dull green. An interesting feature that is associated with the Marine Toad is two parotid gland placed behind their eyes on their shoulders. These glands produce a poisonous milky substance that can affect the heart of many small or medium-sized animals, there have been cases of humans dying from eating a toad or their eggs. As stated before the Marine Toad is native to South and Central America but it has been distributed throughout the Caribbean and Northeastern Australia. 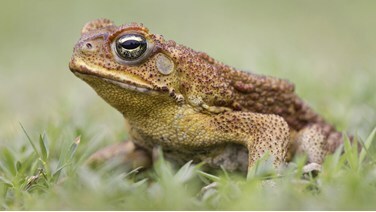 The toads were originally introduced to Australia in 1935 as a control agent for the crop-eating insects. Since then the toad have flourished and have even been seen in Florida and in the Key West. The toad typically live in agricultural and urbanized areas, they have also been found in floodplains and mangrove swamps. During the breeding season, they will be present in freshwater habitats such as lakes, ponds, ditches, and even canals. In these habitats, the toad can fall prey to several animals including snakes, dogs, cats, rats, opossums, and several different birds. 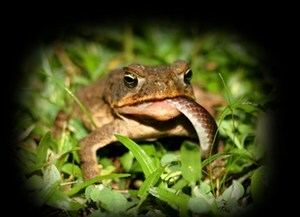 The Cane toads are omnivores that will feed on mollusks, vegetation, and they will even consume other frogs and toads. An ecological niche associated with the toad is the mindset of preying on many different creatures of different sizes if they can fit into their mouth. The toads have also found a niche in Australia with few predators with have allowed the toad to spread in those areas. The Marine toad has serval adaptions, these include the toad being able to lose up to 50% of its body water, they can also survive at a temperature ranging from five degrees Celsius to forty. The Marine Toad will lay her eggs in a chain like structure and can have up to 25,000 eggs these eggs will hatch in about three days. After the tadpole is hatched they will stay in the water for at least 22 days. The toad will not be mature enough to mate until they reach the 2-year mark. Finally, the toad can generally live about 10-15 years in the wild but it is possible for them to live up to 40 years. Since the wide abundance of this species the Marine Toad is on the least concern list and is actually considered a pest in Australia and is killed to make leather and fertilizer. One thing that is threatening the Marine toad is the destruction of their habitats which is forcing them to travel to different areas. There is at present a Marine toad at Wetland Edge and it is a female. There are only one female and no male present. Typically on Fridays unlike in the wild, we feed her insects like crickets instead of vegetation. The toad at Wetlands Edge is actually smaller than I had anticipated and a bit smaller than the ones in the wild. Another difference that I have observed is that her skin appears rough while in the wild the females typically have smoother skin than the males. She appears to be a dark brown color. She is primarily a nocturnal animal, so usually, she is tucked away in the left side corner under the log during the day. She is a reserved animal and does not make any noises or movements. The Marine toad is a fascinating and resilient creature and has become an invasive animal in many areas.